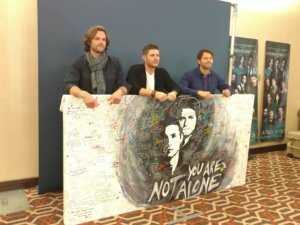 Attention ‘Supernatural’ Fans: Come Meet Us In Minneapolis! Headed to Creation Entertainment’s Official Supernatural Convention in Minneapolis this month? So are we, and we can’t wait to see you! As usual, we’re partnering with a local nonprofit over #SPNMinn weekend—that’s Friday, Aug. 25 to Sunday, Aug. 27—and we’ll need your help to get kind. This time around, we’ve chosen the Wildlife Rehabilitation Center of Minnesota. Read on to find out more! What is the Wildlife Rehabilitation Center of Minnesota? sick and orphaned wild animals” and educates the public about the wildlife in their community. One of the country’s “oldest and busiest wildlife hospitals”, the WRC of Minnesota relies entirely on donations from generous supporters to keep its doors open. How can I help the WRC of Minnesota? You may drop off all donations at the Random Acts table in the convention hall vendors room. That’s OK! Random Acts knows how tough it can be to pack a tiny suitcase with your own clothes, shoes, and toiletries—adding in a roll of paper towels can sometimes be near impossible. If you’re unable to bring along a donation to the convention itself, consider donating to the WRC online through its website here, or purchasing an item on the center’s Amazon wishlist (the item will be delivered to the WRC directly). On a strict budget? Don’t sweat it—you can help us get kind by stopping by the table and making a kindness card for someone, or by decorating a quilt square that will later be sewn into a blanket for a women’s shelter. We’ll be available all weekend if you have any questions about our numerous programs and upcoming events, including our newly-revamped Act Global initiative. 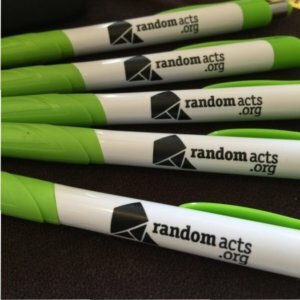 In the market for a new Random Acts button or pen? We’ll have plenty of swag to give away as well, so come by and say hi! Make sure to follow our staffers on Twitter if you don’t already (@RAFundraiser), if you’re looking to stay in the loop over the convention weekend—and be sure to follow us on our main social media channels as well.